Pencil Skirts and Noodle Necklaces: Mom of the Week! I went to work with dirty hair. It wasn't worth the extra fifteen minutes of sleep. Embarrassing. I cried on my way to the office. I was thinking back to all of the wonderful things that Myles' teacher said during his conferences. It was not about his writing, reading, or math skills. It was about his character. Amazing. Anyway, I was thinking about how proud and happy I am of him and a song came on the radio that fit the moment so perfectly. Dork, I know. 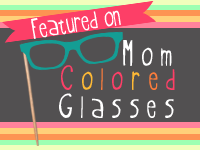 Nevertheless, I am really excited to be the Mom Colored Glasses Mom of the Week! They interviewed me. I'm used to interviewing my kids for posts. This time I was the interviewee. I like being the one asking the questions. It's easier. So proud of you and the awesome mommy, wife, daughter, and friend you are!! Hi there! I'm Dana and I am the author at This Silly Girl's Life blog, I have nominated you for The Illuminating Blogger Award! I have really enjoyed reading your content and I think you deserve this award. You can go to foodstoriesblog.com/illuminating-blogger-award/ to check out more about the award and how to accept it if you would like to. I hope you have a great day and Congrats!